Technology is pervasive in today’s society. Code = culture. Algorithms define our way of life. In his book Being Digital, Nicholas Negroponte coined the term ‘digitality’– in line with terms such as modernity and post-modernity – to describe the condition of living in a digital culture. We all see the ways in which digital culture is transforming a number of sectors for better or worse – Uber and Airbnb are two examples of that. Digital culture gives us high hopes for smart cities and even smarter citizens. There are many good examples of how new technology is influencing the performance context. But at the same time, the theatre domain is still at the start of its transformation, still looking to get a grip on digital strategies and practices. So are other domains such as education and heritage too. 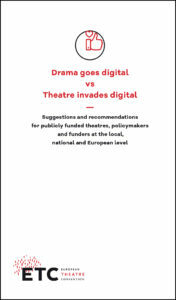 We can already see digital culture’s impact on several aspects of the theatre business, e.g. , through the enhanced use of social media and the optimised outreach of theatres. 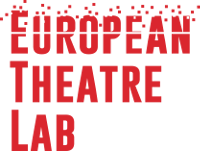 And there is definitely an interest in seeing where technology can affect the core of the theatre, as is apparent in the European Theatre Lab project. The spark is there, and theatre-makers dream of more active and engaging roles for (younger) audiences, and some may already fantasise about improvising with real-time data. A non-representative sample of participants in the Digital Innovation in Theatre ETC conference on 7 April 2017 at the ZKM Center for Arts and Media in Karlsruhe, theatre directors, dramaturges, media artists and other experts from various cultural fields from 17 countries were asked to reflect on their expectations of digitality. 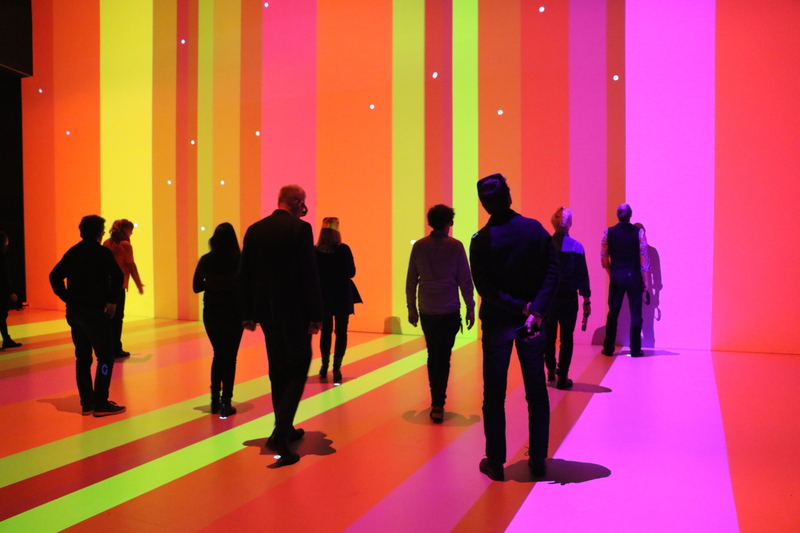 The participants talked about how they were already experimenting with live video and live montage onstage; 3D video mapping; the interaction of real and virtual spaces; digital backgrounds and set designs; and performances connected to the internet. 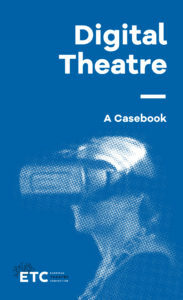 And, of course, digital culture itself is a topic in storytelling and dramaturgy: several theatres are working on screenplays about the merging of reality and virtual reality, the effects of technology on our lifestyle and communication, and incorporating new narrative forms borrowed from game structures and interactive stories. But digital innovation is not only limited to inside the theatre. 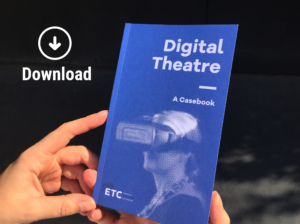 The advent of digital culture has created more and more stages where the work and expertise of theatre-makers are very welcome or even necessary. Think of the growing impact of the Internet of Things where inanimate objects become smart and start to populate our houses: Why should these agents not be dramatic or comedic? Or the commercially driven advances in virtual and mixed reality: How can these experiences become truly engaging and material rather than just visually overpowering or mere shoot-’em-ups. And what would be the dramaturgy for true social connectedness instead of just technical connectedness? Theatre-makers have been thinking about this type of interaction for centuries and would be very welcome in these technology-dominated discussions. Just as design and design thinking is entering business disciplines to deal with so-called ‘wicked’ social challenges, dramaturgy and embodiment can be a new way of pushing the design and technology domain forward, helping us to define and design our quality of life and how we want to live together. Whatever type of stage you anticipate, be it onstage or in real life, innovation means change. And change usually does not happen without challenging existing structures. Even for the most willing of people, it is difficult to go from doing something that is easy, comfortable and familiar to doing something new, awkward and uncertain– regardless of whether the change is an improvement. Change is hard. So, in the end a large part of the innovation question is not ‘just’ technological – it also involves opening up working processes, trying out new things and taking on new mindsets. For people who are eager to explore new things, these new mindsets come more easily. But it already helps to be aware of your own mindset when you consider change and what any other mindsets might allow you to do. In Big Picnic – another European innovation project comparable to the European Theatre Lab that focuses on innovation in botanic gardens – Waag has published a set of seven mindsets that we think would allow people to play with issues such as innovation, co-creation and artistic research a bit better. Taking on any of these mindsets allows you to explore options that you have not encountered before, to better understand what and who you are dealing with, and to create agency and ownership to sustain an intervention. We are talking about mindsets that are sensitive, fearless, hands-on, flexible, experimental, optimistic and critical. So, when you are asked how you want to incorporate digital technology into your play, what would you do if you had a fearless mindset? You would dive in head first, right? What if you were asked to explore the future of theatre with the hands-on mindset? You would probably just start changing everything and anything, and see what happens from there, defining new strategies through experimentation. And what about the future of communication? It could allow for the most beautifully dramatic innovations. That is what the performance domain could bring to the table. In my presentation at the Karlsruhe conference, I challenged the audience to be the R&D department of society, where cultural and social values are made explicit. And I do believe that. It is a response to the growing impact that big corporate structures have on our lives and you will definitely challenge their current approaches. Looking forward to see where you will take us. 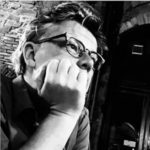 Head of programme at Waag, he is creating interactive concepts, strategizing design research and user involvement, and monitoring the development of the actual ‘thing’. He is mostly interested in the crossover between virtual and physical interactions, in creating a narrative space, a place for imagination. He has worked on many cultural heritage projects and is co-author of several publications on social connectedness or age-driven design. This article has been published in Digital Theatre. A Casebook.